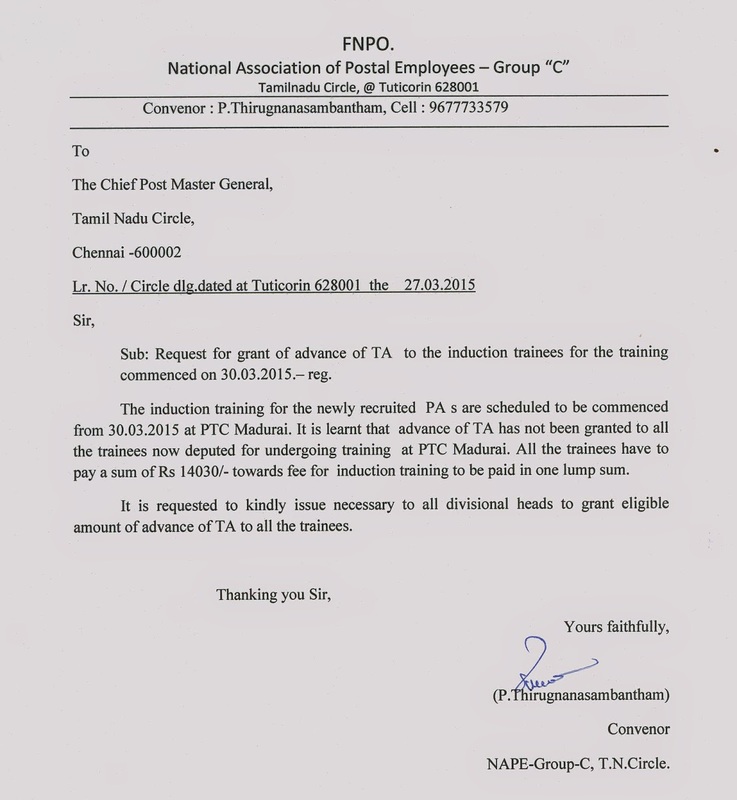 2015-03-22 ~ National Association of Postal Employees, Tirunelveli Division. 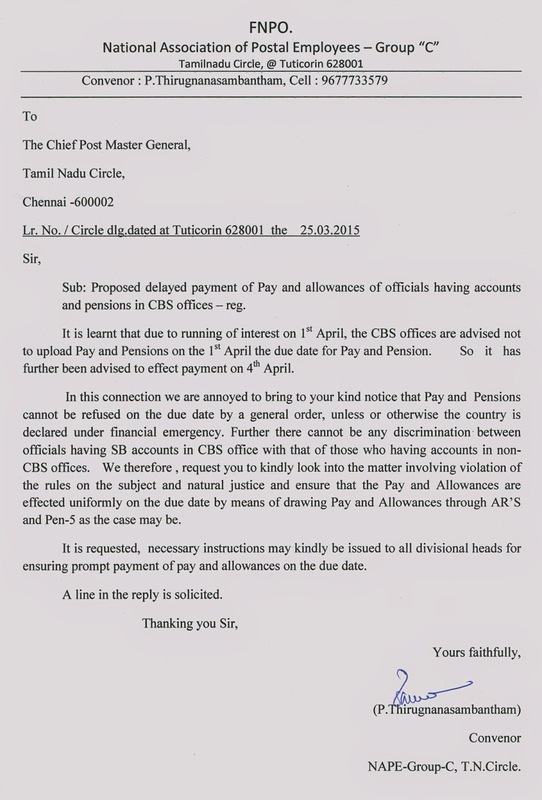 Tamilnadu Convenor Letter to CPMG for timely Payment of Salary. 7th Pay Commission meeting with JCM Staff Side on 23rd and 24th March 2015 Brief of the meeting given by Secretary (Staff Side) Interim Relief and Merger of DA can be considered only if Terms of Reference are amended. 7CPCs query for multiplication factor 3.7 proposed by staff side for arriving at Revised 7th CPC Pay has been explained to 7CPC in detail. No Commitment was given by 7CPC on Date of Effect of 7th Pay Commission revised Pay. 7th CPC suggested for approaching Govt to amend the terms of reference on the issue of GDS. and pensions in CBS offices – reg. It is learnt that due to running of interest on 1st April, the CBS offices are advised not to upload Pay and Pensions on the 1st April the due date for Pay and Pension. So it has further been advised to effect payment on 4th April. In this connection we are annoyed to bring to your kind notice that Pay and Pensions cannot be refused on the due date by a general order, unless or otherwise the country is declared under financial emergency. Further there cannot be any discrimination between officials having SB accounts in CBS office with that of those who having accounts in non-CBS offices. We therefore , request you to kindly look into the matter involving violation of the rules on the subject and natural justice and ensure that the Pay and Allowances are effected uniformly on the due date by means of drawing Pay and Allowances through AR’S and Pen-5 as the case may be. A line in the reply is solicited. Sub:-Payment of Salary and other Personal Payments, Salary by Cash on optional basis or through Cheque/Electronically through Bank – instructions regarding. In continuation of this Directorate O.M. of even No. D-482-558 dated 11.07.2007 wherein clarificatory Orders for disbursement of salary to the staff through POSB Accounts were issued and further O.M. of even No.D-255-326 dated 14.05.2009 wherein decision of Director General (Posts) for disbursement of Pay and Allowances to all employees of Department of Posts through cheque and/or through direct credit to the Salary/Savings Accounts of the employees concerned was conveyed for implementation in letter and spirit. 2. Further, another O.M. of even No. D-473-524 dated 03.10.2012 was issued, wherein decision of DG (Posts) was conveyed that payments of Salary and other personal payments including Retirement/Terminal benefits to all employees of Department of Posts mandatorily be made through Bank including POSB electronically by issuing payment advices with immediate effect. However, in special and exceptional cases, payment of Pay and Allowances including other personal payments to the employees can be made through cheque only with the prior approval of Head of Office/Divisional Head/Head of Postal Accounts office. 3. The case has been carefully re-examined in the light of provisions contained in Ministry of Finance, Gazette Notification dated 30.03.2012 and Department of Expenditure, Controller General of Accounts OM. F. No. 1(1 )/20ll/TA/292 &303 dated 31.03.2012 & 11.04.2012 and it has been decided by DG (Posts), that hence forth, all Government Servants of Department of Posts are permitted to receive their Salary by direct credit to their Bank Accounts or in Cash or by Cheque, at their ‘option’ and payments other than Salary like HBA above Rs. 25000/- and all payments towards settlement of Retirement/Terminal benefits such as Gratuity, Commuted value of Pension, Encashment of Leave Salary, CGEGIS, withdrawal from General Provident fund, etc. by issue of – payment advices, including electronically signed payment advices, Cheque/POSB Account or Bank Account. 4. All concerned are requested to issue suitable instructions to all Drawing and Disbursing Authorities working under their administrative jurisdiction for strict compliance. THE FNPO UNIONS GAVE ORAL EVIDENCE BEFORE THE PAY COMMISSION. THE GENERAL SECRETARY MADE THE POWER POINT PRESENTATAION ON THE ANOMOLIES FACED BY THE CADRE. 3.THE FIFTHH CPC THOUGH AGREED WITH THE RECOMMENDATIONS OF THE DEPARTMENT THAT THE QUALIFICATION SHOULD BE ENHANCED AND AS PER THE MULTIFARIOUS NATURE OF DUTIES ENHANCED PAY SHOULD BE GRANTED- NOT AGREED AND DID NOT MAKE ANY RECOMMENDATION. 4. THE SIXTH PAY COMMISSION DID NOT SETTLE THE ANOMALY AND WITH INTRODUCTION OF PAY BAND AND GRADE PAY THE PRIVILEGE OF UP GRADATION HAS LOST. THE CPC MADE A PATIENT HEARING AND NOTED DOWN SPECIALY ABOUT THE CADRE RESTRUCTURING AND TO CLINCH THE ISSUES.FURTHER DETAILES WILL FOLLOW. (i) There is a provision in the computerised Passenger Reservation System (PRS) to allot lower berth automatically to male passengers above the age of 60 years and female passengers above the age of 45 years subject to availability of the same at the time of booking of ticket. (iii) Instructions are also there to assist senior citizens and physically handicapped persons who have been allotted middle/upper berths by allotting them vacant lower berths available in the train by the ticket checking staff on first come first served basis (after making necessary entry in the reservation chart). (iv) A six berths compartment in Sleeper Class is also earmarked in long distance Mail/Express trains for female passengers. · The existing combined quota of two lower berths per coach in Sleeper class earmarked for senior citizens, female passengers 45 years of age and above and pregnant women (when travelling alone) may be enhanced to four lower berths per coach. There will, however, be no change in this quota being earmarked in 3A and 2A classes. · The scope of instructions regarding assisting senior citizens and physically handicapped persons in getting lower berths in the train has been expanded to include pregnant women also. Hence, onboard ticket checking staff are now authorised to allot vacant lower berths available in the train to senior citizens, physically handicapped persons and pregnant women (who have been allotted middle/upper berths), on approach, on first come first served basis after making necessary entry in the chart. · It has also been decided that the existing reservation quota of six berths for female passengers being earmarked in long distance Mail/Express trains should be in the middle of the coach and also to the extent feasible, the senior citizen quota should be earmarked in the middle of the coach. Supplementrary Results of Postal Assistant/Sorting Assistant Direct Recruitment Examination 2014 held on 11.05.2014(Paper I) and 24.09.2014 to 30.09.2014 (Paper II) released today. Selected candidates are requested to await further communication from the Divisions/Units concerned. Our Federation given oral evidence before the 7th CPC on 26th March 2015. The following General Secretaries /office bearers were presented their views before the 7th CPC . S/Shri D.Theagarajan, T.N.Rahate, D.Kishanrao, N.Ramappa, OP.Kanna, K.Sivadasan, Devenderakumar, Pawankumar joshi and Jagdiesh. Our Federation also submitted GDS Memorandum before the Commission. Chairmen has taken a copy of the cadre restructuring committee report on the following cadres. Postal and RMS, MMS and Civil Electrical from us. He assured that he will call for the report from the department. FNPO hopes that 7th CPC will accept our important demands. 2. Meeting of FNPO leaders was also held with 7th CPC on 26th March 2015 at CPC office at New Delhi. Secretary General & all General Secretaries presented the issues effectively and Pay Commission was also of positive views on most of the items. 3) Observation of GDS substitutes in Andhra circle. Be ready to go on strike on 6th May-2015. Secretary General of FNPO Shri.D.Thiyagarajan met Chair person Postal Board along with President FNPO, General Secretaries of P3 &R4 and discussed the following issues. 1.Irregular suspension of P.3 Divisional Secretary in Kanpur. 3.Irregular recovery in TBOP and BCR promotion. Secretary heard our views patiently and assured to issue necessary instruction to the appropriate authority. Federation Website intimated that the details of the meeting will be published in Apr-2015 Sentinel. 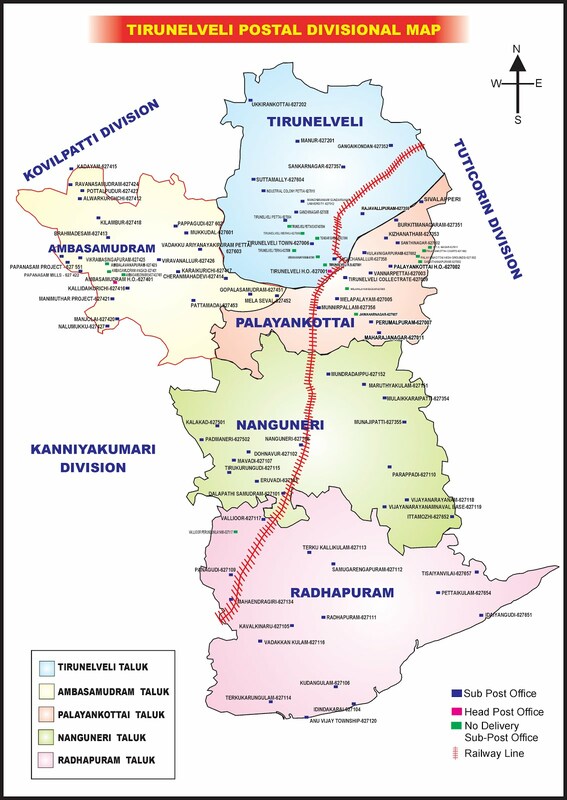 நீண்ட எதிர்பார்ப்புகளுக்கு மத்தியில் ஒருவழியாக RT 2015 அறிவிப்பு வெளியிடப்பட்டுள்ளது.